"This--is what we fought for." Finding the skills to equip one to essentially take over the world is no easy task. Some people are born with the abilities, while others fight tooth and nail to climb the ladder and make their play. Toyo Harada is a man born with a unique ability to sway any audience, which makes him one of the most dangerous men in the world. His true danger is on display in Imperium #1 from Valiant Entertainment. The issue is written by Joshua Dysart, illustrated by Doug Braithwaite, colored by Brian Reber and Dave McCaig and lettered by Dave Sharpe. Toyo Harada is the most dangerous human being on the planet. Imbued with incredible powers of the mind, he has spent his life guiding humanity from the shadows. But today he is a wanted man. His powers are public knowledge, his allies have turned to enemies, and he is hunted by every government on the planet. Instead of surrendering, Harada has one last unthinkable gambit to play: to achieve more, faster and with less, he will build a coalition of the powerful, the unscrupulous and the insane. No longer content to demand a better future, he will recruit a violent legion from the darkest corners of the Earth to fight for it. The battle for utopia begins now. Imperium #1 is less about allowing the reader to dine on a fine story and more about setting the table. Dysart opens the issue with a society one-hundred years into the future that boasts utopian values in line with Toyo Harada's vision. It's through this lens that Dysart slowly peels back the layers and starts to establish the stakes for the world and its players, stakes which act primarily as uncertain. The opening is a bold contrast to the remainder of the issue, which also serves as the meat of the series. Harada is a very convincing individual and his ability to sway those under him--even bending them to his will--is extremely powerful and exemplifies his persona as an anti-hero. Dysart isn't rushing to reveal the entirety of his tale; rather, he's giving the reader a chance to get settled in and comfortable before he inevitably pulls the rug out from under the reader. Crafting the utopian society visually is Braithwaite, who does a fantastic job at the task. His presentation of a world of general positivity is accentuated by brilliant blue skies and gleaming skyscrapers, all of which serve as a backdrop for characters who aren't shy about exploiting their inner powers. There are a lot of defining character illustrations that seem to reinforce one particular emotion or another, with Braithwaite imbuing the pages with the requisite level of sentiment. There's a pretty harsh transition from utopia to violence about three-fourths of the way through that Braithwaite handles pretty well, moving from slower scenes to much more frenetic action. Colors by Reber and McCaig are vibrant and help to underscore the tragedy that belies the happiness in the future world. 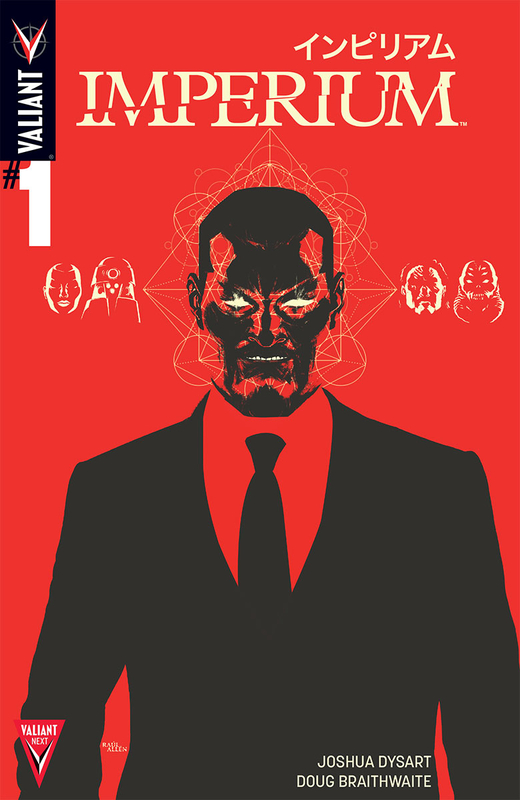 Imperium #1 is a fascinating first issue crafted by a team with a reputation for solid work. Harada isn't fooling anyone in the book and longtime Valiant readers will quickly realize that Harada is a man with a cold, focused vision that he imposes on those in his service (and devotion). Dysart's first issue is an awful lot of prologue that's buoyed by a somewhat rapid final few pages that points the series in the direction it wants to go. Braithwaite's illustrations are captivating and give the reader an intimate look into a "better" life, offering a good mix of characters interacting with one another in positive and negative ways. Imperium #1 is a pretty strong first issue that doesn't shy away from ambition and is comfortable in a villain leading the charge. Imperium #1 is in stores now.